Rice krispy treats made with peanut butter and chocolate with an added layer of creamy chocolate and peanut butter ganache. Rice Krispy Treats are such a classic favorite of mine. They are probably one of the first no-bake sweets most of us learned to make when we were growing up. Chewy, gooey, and super adaptable – a blank canvas for adding in anything and everything your heart desires. I love all the different ways you can dress them up and they make an easy, no-bake treat that you can whip up with little notice. These Double Chocolate Peanut Butter Rice Krispy Treats start off the same familiar way with some crispy rice cereal, melted butter and marshmallows. By adding in some creamy peanut butter and melted chocolate, they are transformed into an even more irresistible and decadent dessert. 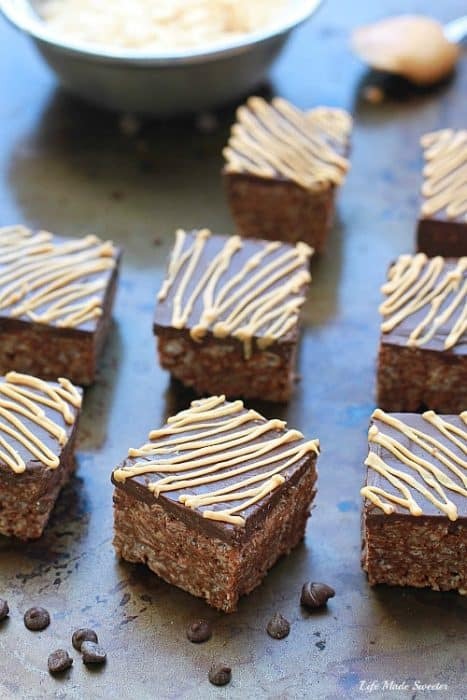 You can never go wrong with chocolate and peanut butter – they make the best combo so I decided to top these rice krispy treats with a layer of chocolate and peanut butter ganache and finished them with a pretty peanut butter drizzle. Line an 8x8 square pan with a sheet of aluminum foil coated lightly with cooking spray, leaving an overhang on the sides. In a large saucepan, melt chocolate chips and butter over medium heat. Add, salt, peanut butter and marshmallows and stir until completely melted. Remove from heat. Add crispy rice cereal. Stir until well coated. Using a flat spatula, press mixture firmly and evenly into prepared pan. Allow mixture to cool and set for 30-40 minutes. In a microwave-safe bowl, melt peanut butter and chocolate chips in 30-second increments until smooth, stirring constantly in between each increment to avoid the chocolate from burning. (Do not over melt). Pour melted chocolate mixture on top of cooled crispy rice cereal and spread evenly using an offset spatula. Heat peanut butter in the microwave for about 10-15 seconds. Scoop peanut butter into a small ziptop bag with a tiny hole in the corner snipped off. 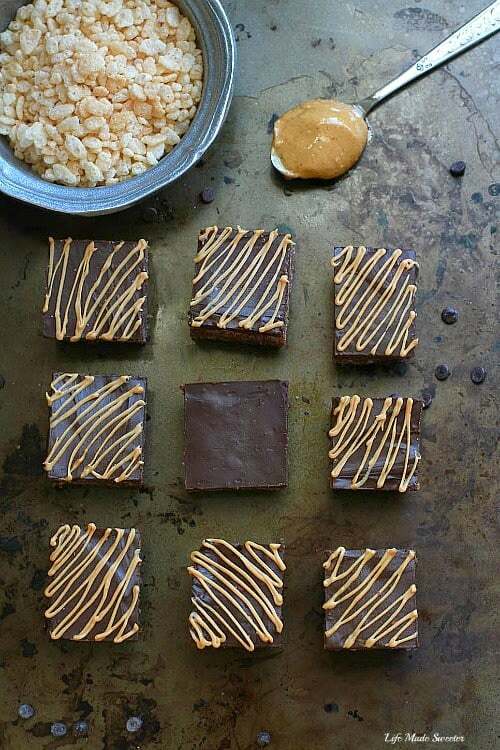 Drizzle peanut butter over the chocolate. Allow to set up and cool completely for about 2 hours on the counter or place in the fridge or freezer for faster set up time. Cut bars into evenly sized squares. Allow bars to come to room temperature before serving. Your photos are lovely! That ganache and the peanut butter drizzle are so perfect and look beyond delicious 🙂 Heading over for the recipe! These look incredible, Kelly! My peanut-butter loving husband would go to town with these treats! Oh my goodness I LOVE rkt’s and I don’t make them nearly enough. Peanut butter and chocolate can only make them more irresistible! These are heavenly, Kelly, and your photos are just jaw-dropping! Seeing my kids this weekend…they will love these! Nothing like chocolate and peanut butter to create a perfect flavor combination! Thanks, Kelly! Heading over to check the recipe out! Love rice crispy treats! I really need to make some soon! Great combination of flavors, lovely pictures!!! I am DYING over how fabulous these look, Kelly! Rice krispy treats are a big favorite of mine and I’m loving all the chocolate/pb action going on here! Can’t wait to try these. Hopping over to the recipe! We love Rice Krispy Treats!!! love the addition of the creamy peanut butter and melted chocolate . . oh baby!!! WANT SOME!! Oh yes, you totally took rice krispy treats to a whole new level. Yum! Rice krispie treats definitely take me back to my childhood! These chocolate peanut butter ones look amazing, Kelly! I don’t think I could find a better rice krispie treat anywhere. I love your creativity! Pinned! 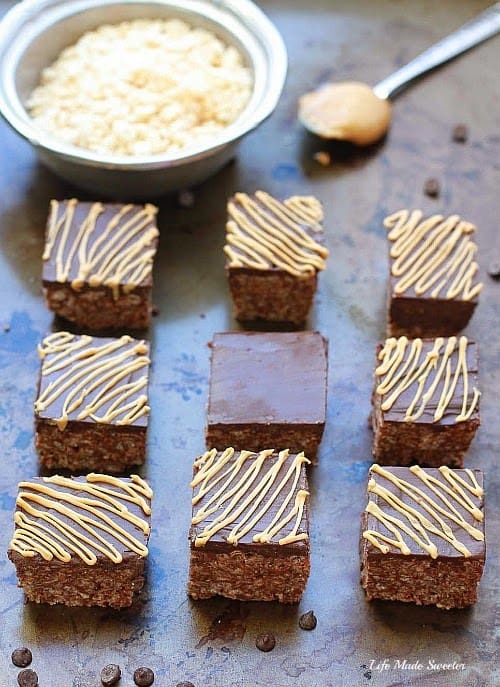 These look so rich and tempting with chocolate and peanut butter! You’re killing me here, Kelly! : ) You basically do what I dream about and don’t quite dare to do, and you do it beautifully! I have made chocolate rice krispies and they’re good but to add PB and more chocolate is a dream for me! Looks unbelievable! 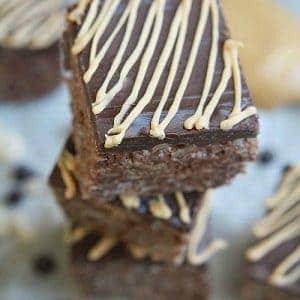 Have you ever had/made Baked’s PB chocolate bars? They are so similar and so good but I have a feeling yours taste even better. Kelly such amazing looking treats these are! I can imagine how chewy they will be in my mouth! Yumm! Double the chocolate, double the love! I just love rice crispie treats. They’re the first sweet treat I learned how to make when I was little. Love the peanut butter too! I had to do a double take because I just knew these were brownies. Rice Krispy Treats? WOW. I have to make these. Your photos are making me salivate. That ganache… I can just lick the screen. Um…wow. Yeah, these look perfect. Nothin’ better than chocolate and peanut butter! I LOVE Rice Krispy Treats, and your variation looks so mouthwatering! LOVE THIS! I always find krispy treats to be too sweet. By adding chocolate and peanut butter, they would be much more balance and less sweet! Your presentation is stunning! I need these now! Oh gosh, it has been so long since I made rice krispy treats of any kind! And then you went and made some with chocolate and peanut butter – which is the best combo ever! I love rice krispy. They are sweet. I have to check them out! Oh yummmm! I love rice krispy treats. 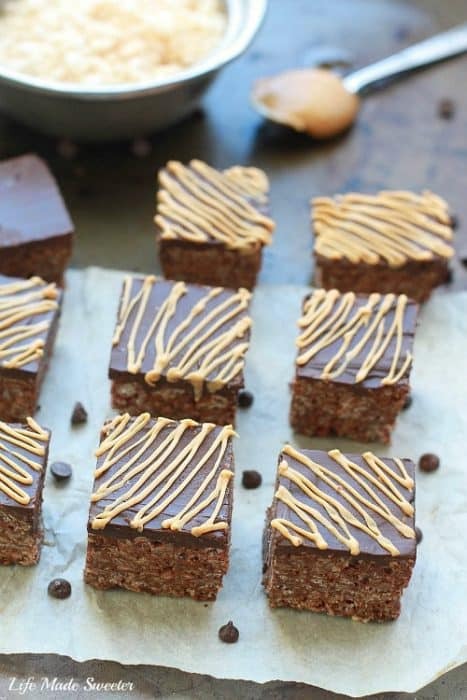 Adding chocolate and peanut butter make these sound fantastic! Checking out the recipe now because I need to make some at home. WOW! YUM! Talk about taking rice krispie treats to a whole other level! Peanut butter here I come! These are so perfect, love peanut butter and chocolate together. These would be my favorite Rice Krispies treats ever, Kelly! You made them so sinfully indulgent with that ganache, and I love the peanut butter swirls. Heading over to get the recipe! Nice treat! Chocolate and peanut butter.. yummy! Love all the chocolate you packed into these krispy treats! Oh, man, these look so good! I love the double chocolate AND peanut butter. These may be the best rice crispy treats ever! Kelly, love that you added peanut butter to these! Would you believe that I was never fully sold on Rice Krispy treats until only about a year ago? My boyfriend made them and he decided to dial up the amount of marshmallows that the recipe called for, browned the butter, and the result was a completely addicting dessert. I think the flavor profiles you have here would be a great twist! These sound SO yummy! I don’t think I’ve ever tried any type of rice crispies besides the original flavors, but chocolate and peanut butter sounds amazing. 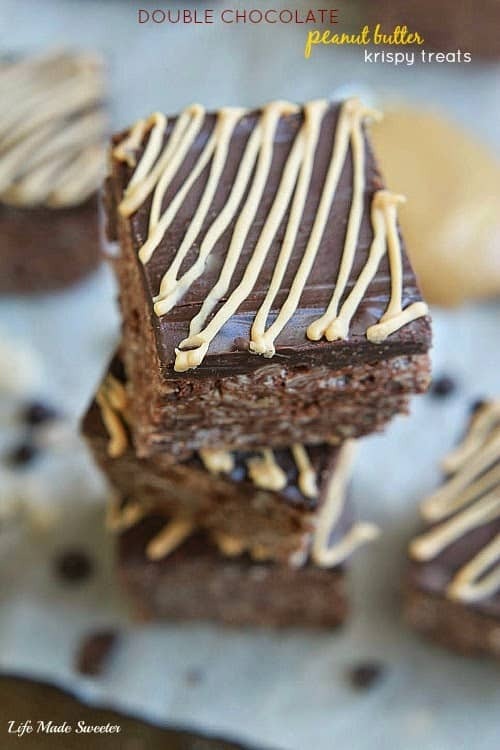 Wow Kelly, these crispy bars with peanut butter and chocolate just sound and look fabulous…I can imagine having a big bite of it…luxurious! I don’t think I’ve actually ever made rice crispy treats before, but I love no bake desserts, so I should probably get on it! These look delicious Kelly! I love anything chocolate and peanut butter flavored and I can just imagine how delicious they are to take a big bite of! These look to-die-for!!! Off to check out the recipe!!! Adding chocolate and peanut butter to rice krispie squares is brilliant! Love it! Drooling over here! These rice krispy treats looks amazing! Pinned! I’m in a food heaven!! Perfect snack for me! Can you believe I’ve only made basic Rice Krispies? These look great – I’m sure I’ll be trying them soon! I totally love that you dressed up this classic treat with chocolate and peanut butter. you just can’t go wrong with that combo! Seriously – you did a fantastic job – love these and your photos are GORG as always! Mmmm chocolate and PB! Yum yum yum! I love these Kelly, plus the extra chocolate on top, these sound amazing! That chocolate on top is calling my name! I love this twist on a classic treat! What a great twist on a classic treat Kelly! I would happily have one or two of these. LOVE that flavour combo! Peanut butter is such a delicious addition! Gorgeous photographs too. Hope you have a lovely weekend! These look way better than regular rice krispie treats! Love the PB/Chocolate combo! These rice krispy treats look really tasty! I love the peanut butter twist! Wow, not only do these look amazing but they have to taste it too! They will be such a hit at a party! This is a rice krispy treat I could eat a whole lot of. Loving the chocolate and peanut butter twist to these, Kelly. It’s so creative! I only recently started branching out with rice krispie treats, but I am LOVING how versatile they are!! Your version sounds amazing… nothing better than chocolate and pb together! WOW! Now this is a Rice Krispy Treat! It’s on steroids and I’m loving i! OMGosh Kelly – you have me craving Rice Krispy Treats at 9PM. And, you know they are good at any time of the day – so I am all in! 🙂 Pinned! You’re speaking my love language with these. I’m not a huge krispie treats fan unless there is PB & C. Bring these on! Mmm! I love rice krispy treats so much! 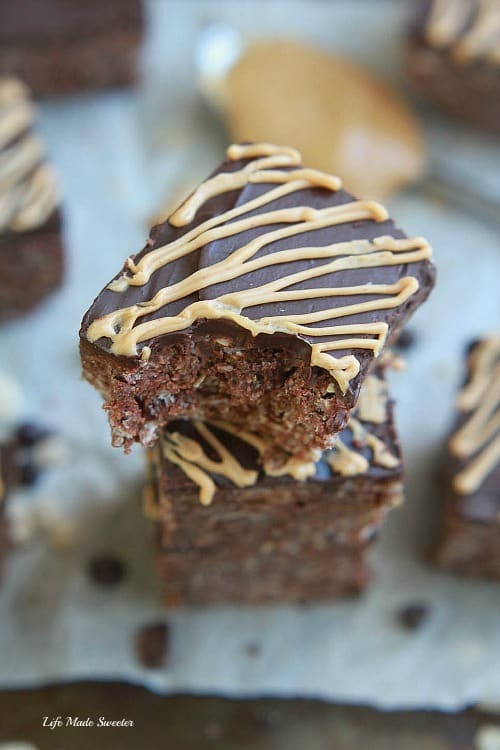 But with peanut butter and chocolate, these sound completely divine!